Well for one of the best known ceratopsians, it sure took me a long time to draw one: This is styracosaurus albertensis, one of the most recognizable ceratopsians. With 5,5 metres in length it was of average size for a ceratopsian. Its most notable feature is the spiked frill that maes this dinosaur stand out from all others. Yeah. That would be pleasant to watch. Wha are you talking about? what studio will remake valley of gwangi? I think either paramount or universal. Also happy new year. Remember this animal from an old b&W dinosaur movies. Or was it supposed to be a Monoclonius? 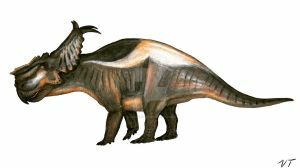 Not that the latter matters, since most species of Monoclonius have either been reassigned to Chasmosaurus or Centrosaurus anyway. Its me or look more bigger? it still frightens me how massive that beak is. And it's just over half the size of triceratops. methinks you wouldn't want to forget your hand in there. Indeed the artist really did a fantastic job and it shows.